Today our “Footsteps of Paul” trip began! God has brought together 18 of us for this 11 day Greece tour, with an extension to Rome and Florence, Italy. Meeting in Chicago for our international flight, the first leg of the trip took us to Frankfurt, Germany. 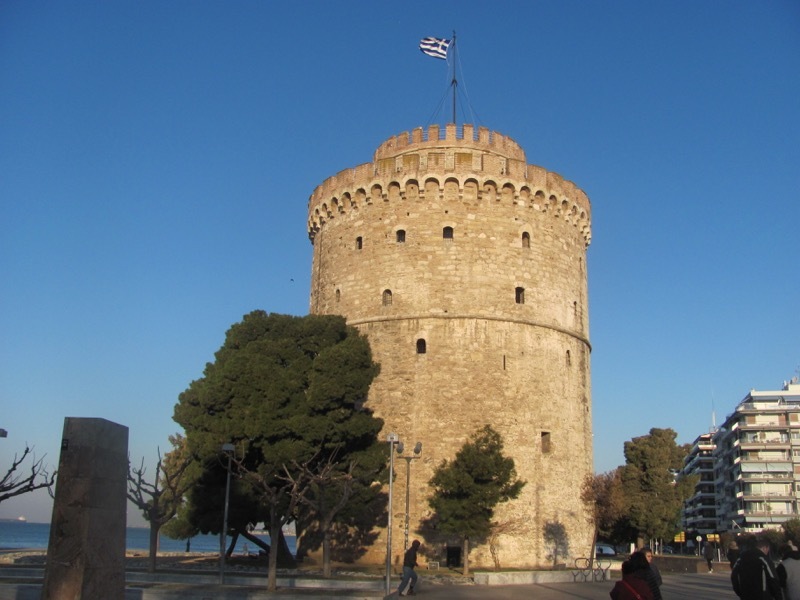 Following a 2.5 hour layover, the next flight took us directly to Thessaloniki, Greece. It is a town of 1.2 million today. After picking up our luggage, we met our guide (Aliki) and driver (Christos). From the airport we drove about 35 minutes to our hotel in the center of Thessaloniki. Many in the group went out and explored the city prior to dinner. The sunset was amazing on the Aegean Sea. Following dinner, about half the group enjoyed an optional walk. The city was buzzing with people in the stores and shops on this Valentine’s Day here in Greece. Returning to the hotel, we retired for the evening. We all are looking forward to our first full day here in Greece! Tomorrow we will be walking in the Greek world that the Apostle Paul knew. The world and culture of the New Testament is about to come alive! Today was our first full day here in Greece, and it was a great one! While temps were cool with a high about 50, we enjoyed full sun and clear visibilities all day long! Leaving the hotel shortly after 8 a.m. and reading 1 Thessalonians 1., we first bussed around Thessalonica. We saw the White Castle, a structure that dates to the Byzantine Period (4-6thcenturies AD). Driving to the top (acropolis) of the city provided us a wonderful panoramic view of the harbor and city below. Even Mt. Olympus, a 9,500 foot mountain, could be seen in the far distance. From here we drove north in ancient Macedonia to Philippi. It was about a to hour drive. We stopped on the way for bathrooms, coffee and our first taste of baklava. 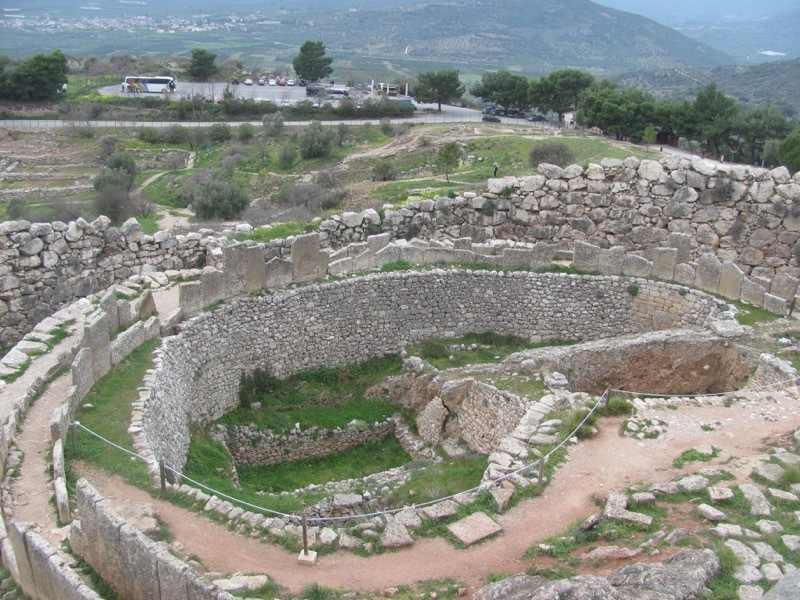 The ancient city of Philippi was named after Philip II in 356 BC. The city was used as a garrison for Roman soldiers when Paul visited here on his second missionary journey. We read from Acts 16 near the suggested “prison” where Paul and Silas were bound. Of the impressive ruins of this ancient city that we saw included the theater, the forum, the bema, public latrines, mosaics, and two Byzantine basilicas / churches. The city was located on the Via Egnatia, the main Roman road that ran about 700 miles from Istanbul towards the west. Nearby we stopped at the Zygaktis River where Lydia was befriended by Paul. She converted to Christ and was baptized in the river. We enjoyed seeing the Greek Orthodox chapel here built in her honor as well as a time of singing and Scripture (Acts 16) by this small river. Kavala wasour next site. This was a port city built on the Mediterranean Sea. In biblical times it was called Neapolis. Paul sailed into this port city following his Macedonian vision he had at Troas. We first enjoyed a panoramic view of the city (and the Island of Thassosin the distance, known for the marble extracted here) before walking down along this picturesque harbor. It was humbling to think that Paul himself sailed into this port back 2,000 ears ago! A beautiful mosaic on the side of a church preserves Paul’s entrance into Europe here. Around 5, we drove back to Thessaloniki to our hotel for a late dinner. It was a great first day here in Greece! Today was another beautiful and sunny day, with highs in the 50s. We checked out of our hotel in Thessaloniki after breakfast and began our drive towards the south. Leaving the hotel we read from 2 Thessalonians 3, hearing Paul’s words of encouragement to the early church he founded here. Our first stop was Berea, about an hour away. Although there was no archaeology to see here, we read from Acts 17 about how the believers “searched the Scriptures daily…” There is a monument here in memory of Paul’s ministry here during his second missionary journey. Walking through the town, we also saw the Jewish synagogue. During WWII, about 4,000 Jews were killed by the Nazis here, leaving only about a 100 or so. Here we also met an evangelical pastor named Nicolas. It was a delight to hear about his ministry. Even though he spoke no English, we felt a kindred spirit with him. We sang a few songs with him in his small chapel. Driving about 20 minutes, Vergina was our next stop. This was once the ancient capital of the Macedonians. This was where the famous Philip II, the father of Alexandria the Great, was buried. His tomb, as well as a few others, were discovered in 1977. We walked through the museum here, seeing not only the tomb but the very impressive items found in the tombs. This included mass amount of gold, armor, and other personal items. This discovery truly rivals the finds of some of the ancient Egyptian pharaohs! Leaving Macedonia, we drove south to Kalambaka. This is the area of the snow-capped Pendos mountain range, the heart of Greece’s inland area. Along the way we made a brief stop for a bite to eat. 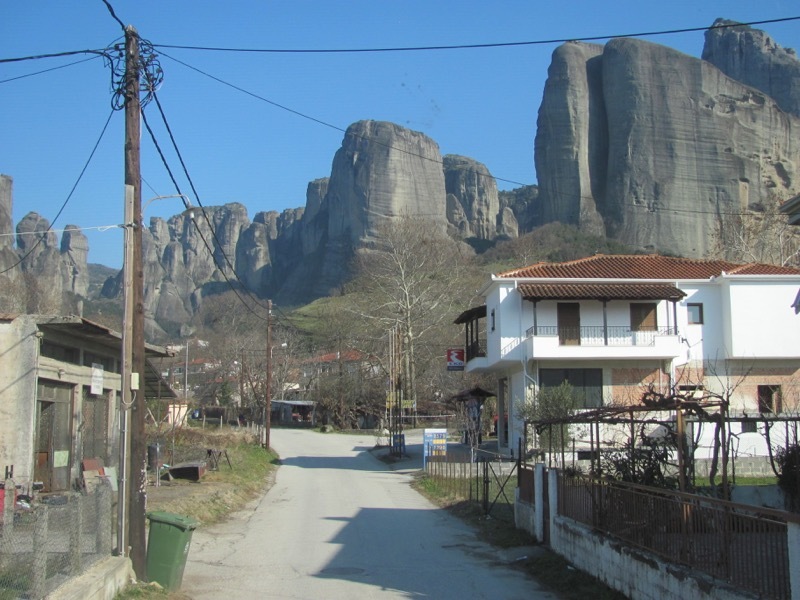 Arriving at Meteora, we saw the six famous Byzantine – Greek Orthodox monasteries located here. Their history goes back to the 14th century when the monks sought refuge in the cliff-side caves. Then they fled higher to build the original wooden shelters, which were later transformed into monasteries. There are all perched high on “stand-alone” unique rock formations. We visited one of them, the St. Stephen’s Monastery/convent. The view from the top was spectacular! We learned about the Greek Orthodox religion. Leaving St. Stephen’s, we made several other stops for different “panoramic” views of this amazing and unique place here in the central part of Greece! Nearby was our hotel in Kalambaka. After checking in, we enjoyed dinner together followed by a brief time of devotion and singing. Once again, we were blessed with a brilliantly sunny day, with highs a little warmer in the mid 50s. Upon leaving, we opened the day with a devotional from I Corinthians 3about being the temple of God. Departing Kalambaka, we drove about 3 hours to Thermopylae (Thermopolis) where the famous battle between the 300 Spartans and Xerxes & the Persians took place. The battle scene that took place in 480 BC was a small narrow pass between the mountain range and the Aegean Sea (today the sea has receded about a mile. In the story, Leonidasand 300 fighting men (along with another 700 Thespian fighters) tried to hold off Xerxes at this pass. The Persians prevailed against Leonidas as a traitor informed Xerxes of a secret pathway that led to the surrounding of these courageous Spartans. However a year later, the Persians met their defeat at the sea Battle of Salamis. All there is to see today is a monument of Leonidas along with two other men symbolically representing the Spartan mountains and river. Entering the Parnassus mountain range, we drove towards Delphi. The windy road up and down the mountains provided spectacular views. We passed through the town of Arahova, the primary ski resort village here in Greece. Following lunch, we arrive at the archaeological / classical site of Delphi. In classic Greek mythology, Delphi was considered the navel of the world. Today, next to Athens and Olympia (that we’ll visit tomorrow), Delphi is the leading classical site in all of Greece. The site of Delphi was simply amazing! Although the path to the stadium was closed for renovation, we saw many things in this site built on the edge of the mountain. 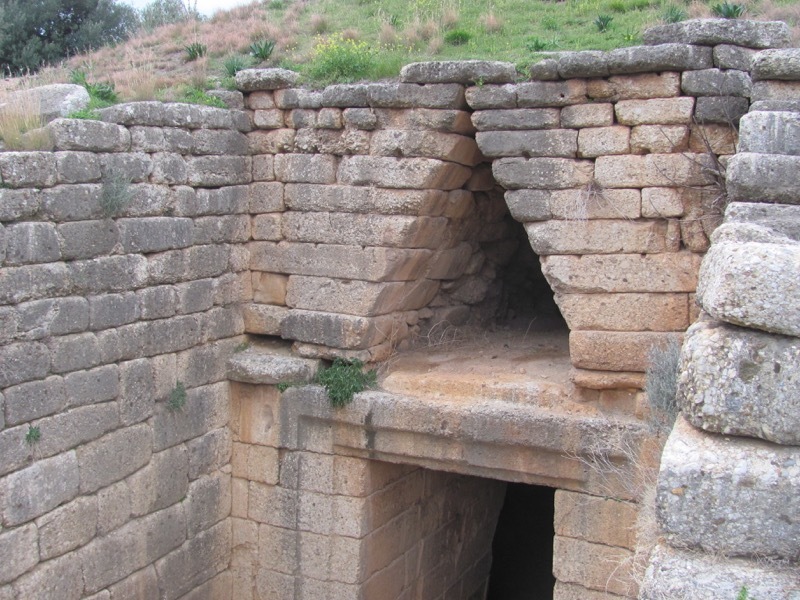 This included the Treasury, the theater, and the Temple of Apollo. The oracles of the gods took place in an inner / underneath area of the temple itself. Across the road on the lower part of the city is the gymnasium and the Sanctuary of Athena Pronaia. All of these ruins date primarily between the 7th (the first Temple of Apollo) and the 4th century BC (what is seen today). 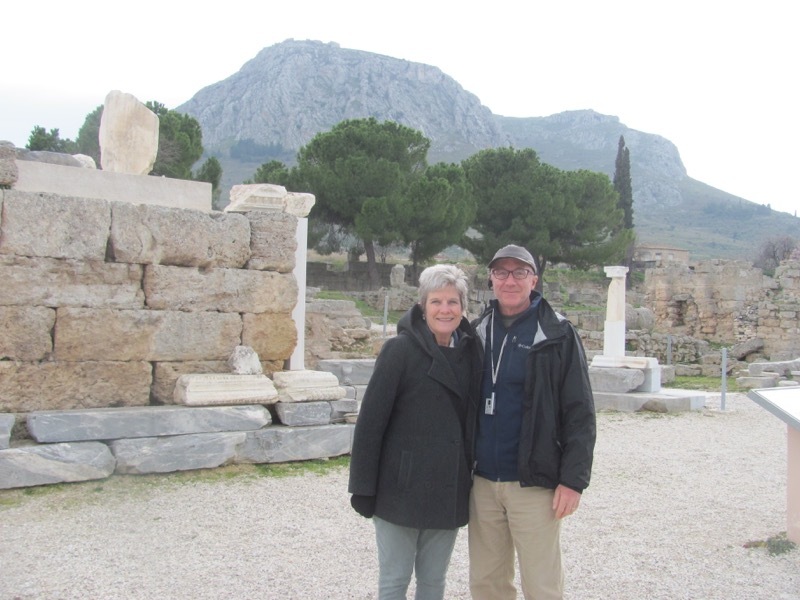 Although Delphi is not mentioned in the Book of Acts, it is hard not to believe that Paul was here or at the very least familiar with the city. Following the visit of the site, we entered the Museum of Delphi. 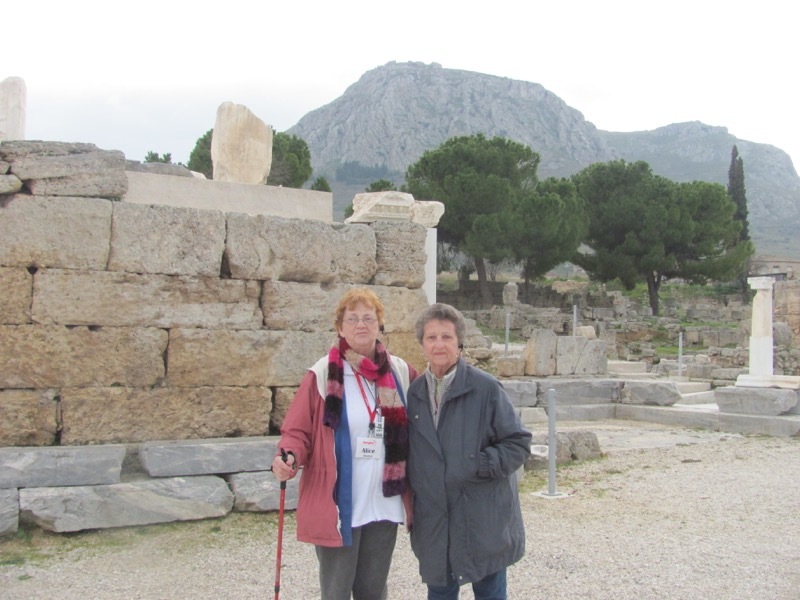 Here we saw many amazing artifacts from the site of Delphi. This included various reliefs of the gods (Zeus, Artemis, Apollo, Aphrodite) as well as Hercules. 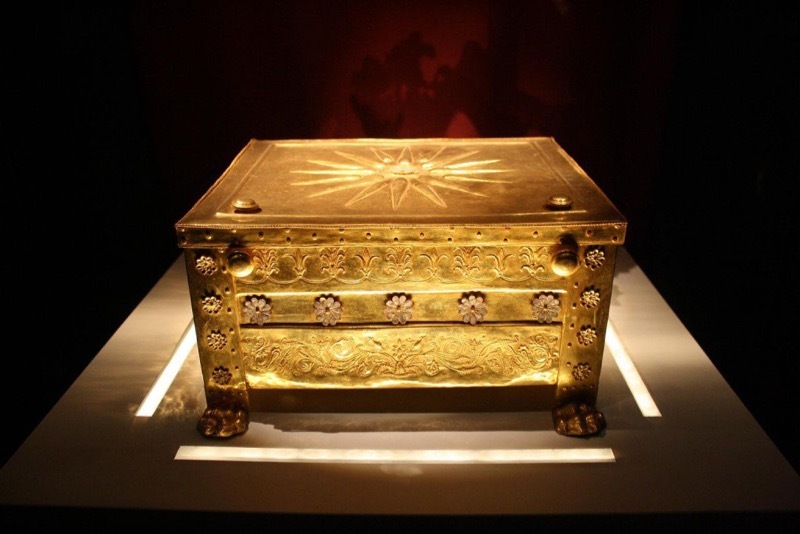 The gold horde found near the temple was also displayed. The face of Apollo is pictured here. Other artifacts included the horses from the pedement of the Treasury, figurines, a large bronze “chariot man” dating to 476 BC (given to Apolllo as a present), and the famous Inscriptionof Gallio. The inscription describes Claudius writing about of receiving advice from a procounsul named Gallio. He was the Roman senator who dismissed the charge brought by the Jews against Paul in Acts. Thus, the inscription serves as an important archaeological marker in reconstructing the chronology of Paul’s life and helps date Paul’s presence in Corinth to about 50-52 AD. After the museum closed (4 p.m.) we drove into the modern city of Delphi just 5 minutes away. After checking in, many walked back to town, enjoying some free time and shopping. The view of the Adriatic Sea to the west at sunset was amazing. Following dinner at 7, we gathered once again for a brief meeting of singing and sharing. Today was a partly sunny day, with sun the morning, and a mix of clouds and sun in the afternoon. The temps were warmer, with highs in the low 60s. We checked out of our hotel in Delphi after breakfast and began our drive west and then south. The drive along the Adriatic Sea(also called the Ionian Sea) was very scenic. After driving along the coastline for about 2 hours, we stopped for wonderful snacks just before we crossed Greece’s suspended bridge called the Rio Antirrio.It was built in 1997 ahead of the Greece Olympic games shortly after. It connects the Continental province with the Peloponnese province to the south. Driving another 2 hours we arrived at Olympia.What a remarkable archaeological site this is! Located along the Alpheios River, ancient Olympiawas where the first Olympic Games were held in 776 BC. 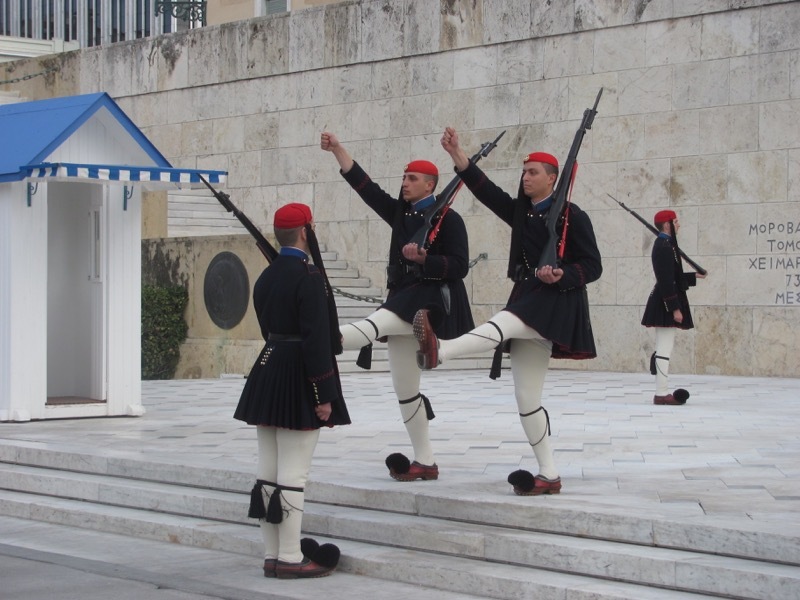 The Games symbolized national unity. As we walked through the archaeological site, we saw many impressive ruins. These included the gymnasium and palestra (dates to the 2ndcentury BC), the Temple of Hera (dates to the about 600 BC. Hera was the mythological wife of Zeus), and the workshop of a sculptor named Pheidias who made the 40 foot high statute of Zeus. This building was later turned into a church in the 3rdcentury AD. The highlight/prize of the ruins is the Temple of Zeus (it dates to the 5thcentury BC). It had columns that were 33 feet high and about 12 feet wide. The statue of Zeus was positioned in the middle of the temple. Today only a few of the columns are reconstructed. We ended the tour of the site at the stadium. It could hold 45,000 people and was used for foot races. The runners ran naked a distance of 365 feet. It dates to the 4thcentury BC. Here we read from Acts 13 (about Paul and Silas being identified at Lystra and Derbe as “Zeus” and “Hermes/Mercury”) as well as from 1 Corinthians 9:24-27. Paul encourages us to “run with perseverance for the prize…” It was fun to run or walk the distance of the stadium. From the site we walked to the very impressive museum. Displayed in the museum are many amazing discoveries from excavations of Olympia that began in 1875. Before driving up the hill to our hotel, we enjoyed walking around (and shopping) in modern-day Olympia. Although it is “off-season,” a few of the stores were open. After checking into our hotel, we enjoyed some free time before a group gathering at 6:30 and a buffet dinner at 7. It was another great day in Greece! Today was our first day with some light showers in the morning while driving, but the afternoon was overcast yet rain-free. The temps were in the high 50s. Once again the day started with a drive of about 3.5 hours. The bus experienced a hose leak of some kind but Christos our driver was able to fix it. Following a quick snack stop on the way, we arrived at Mycenae. From here we continued about 40 minutes to Corinth. The Apostle Paul spent 1.5 years here during his 2ndmissionary journey. 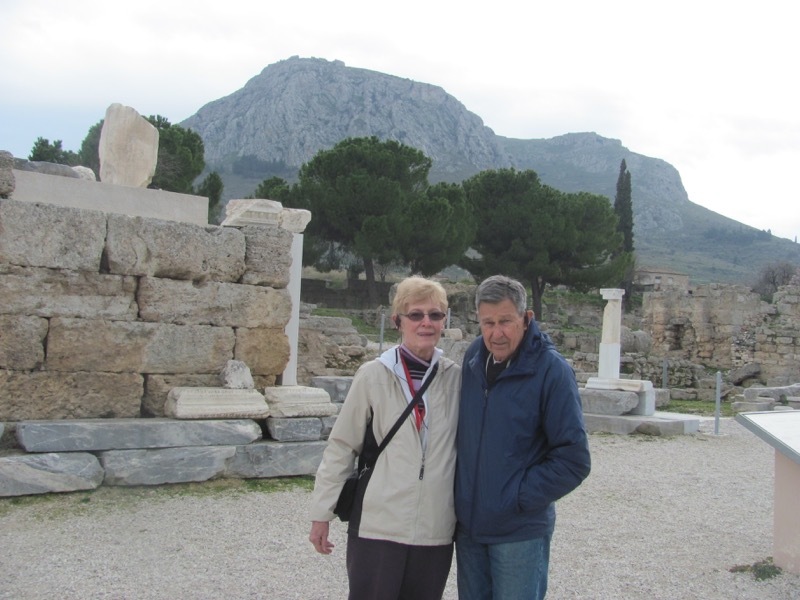 We saw many things here, including the Temple of Apollo, the agora (market place), the bema (where Paul would have taught and stood before Galliowhose inscription was found at Delphi), and Roman Forum (which was larger than the one in Rome), and the Roman street that connected the one of two harbors to the city. There were 14 temples here, including temples dedicated to Athena, Asclepius, and Aphrodite (located on the acropolis). We read from Acts 18 and 2 Corinthians 9. Before leaving Corinth, we also walked down to the theater. 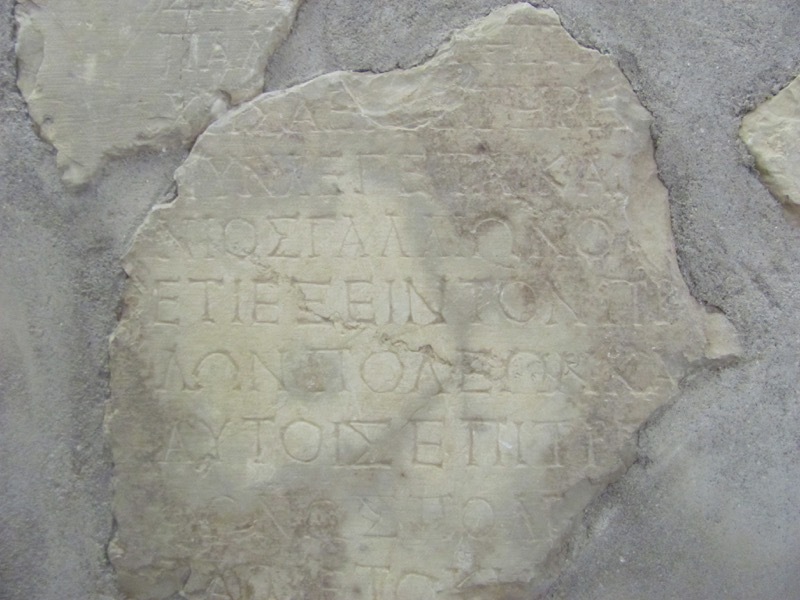 Here the Inscription of Erastus is displayed. We read from Romans 16 that mentions this man who served in “public works” here. Perhaps Erastus was a primary supporter of Paul and his ministry. On the way to Athens we crossed the Corinthian Canal. This connects the Adriatic and Aegean Seas together. The canal was built in 1882 and finished 11 years later in 1893. It is 4 miles long, 80 feet wide, and 280 feet high. The water level is 26 feet. It is really an amazing engineering feat! Arriving in Athensabout an hour later, we checked into our hotel. Following dinner, most in the group enjoyed a walk to Constitution Square, the downtown area of Athens, the capital of Greece. We even had our first glimpse of the famous Acropolis all lit up at night! We are looking forward to spending the next days here and the first of four nights. Today was our first day in Athens. We enjoyed sunny skies and warm temps around 70! After breakfast we started with a bus tour of the city. We saw and stopped at the House of Parliament, the Tomb of the Unknown Soldier (where we saw the “changing of the guards”), the remaining pillars of the Temple of Zeus, the Hadrian’s Arch, and the Old Olympic Stadium (renovated in 1896 for the first modern Olympic Games). We also saw many of the neoclassical buildings of Athens. Because the security guards at all the public sites went on “strike” today, we could not visit the Acropolis & Parthenon (we will visit this on Wednesday). We still got some good “first looks” from a distance of the Acropolis. However, we did walk to the top of Mars Hill (“Aeropagus”). From here we could see the various temples, the Stoa, and the Agora (the “marketplace” and ancient center of the economic and public life of the city where Paul preached to the skeptical Athenians). We also read from Acts 17 about Paul sharing the message of Christ on top of this hill. Praise God for the several who accepted the message that day (Dionysus and Damaris). 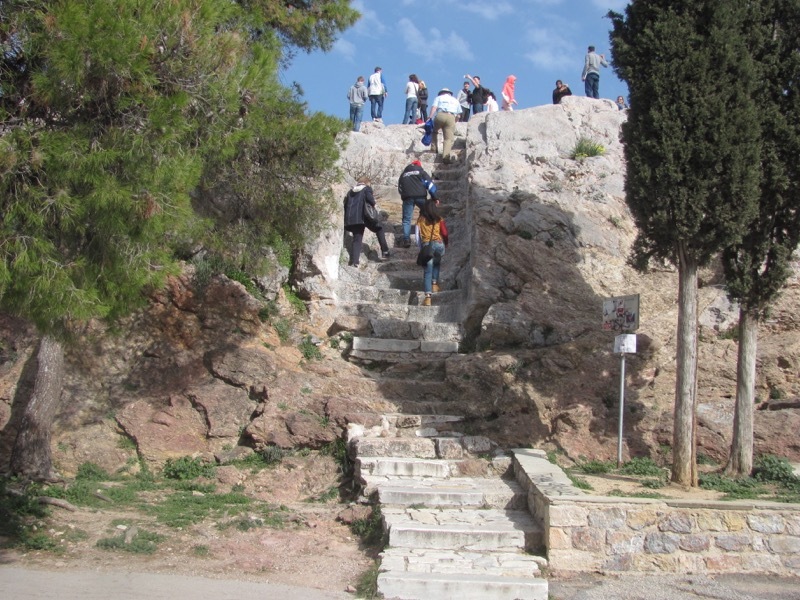 Towards noon, we visited the highest mountain in Athens (1,000 feet vs. the 510 feet high Acropolis) – Lycabetus. Six in the group hiked to the top while the others took the cable car/incline to the top. The view was spectacular from the top. Almost the entire city of Athens could be seen (4. 5 million residents). Even the Aegean Sea and the Port of Piraeuscould be clearly seen! From here most in the group enjoyed the afternoon in the Plaka (“old city”) of Athens. Some had a traditional Greek lunch while others shopped a bit. It was fun to experience a little traditional Greek life here and the “sights and sounds” of every-day Athens! We all returned to the hotel for dinner and a free evening. Today was another spectacular weather day here in Greece, making our visit to three Greek islands absolutely perfect! The high temp was in the mid 60s. It as a wonderful relaxing day out on the Aegean Sea! Following an early breakfast, we drove to one of the ports of Athens for a day-long ferry ride. Sailing on the Aegean Sea about two hours, we arrived at the first island, Hydra. This island in particular provided a picturesque port. We had about an 75 minutes to explore the island. About 4,000 live on Hydra. After boarding back on the ship, we enjoyed lunch provided to us by the ferry. The second island was Poros. After docking, most in the group hiked up to the city tower. 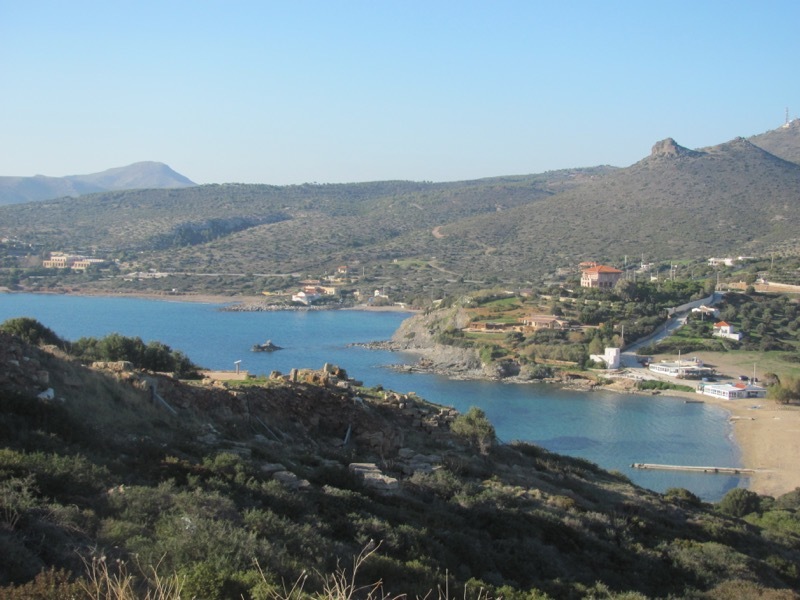 This island is used by the Greek Navy in training their young sailers. The third island, Aegina, was a largest of the three we visited. Known for the growing of pistachios here, many bought goodies. A few in the group explored the Temple of Apollo that once stood here in the 5thcentury BC. It was quite impressive. An early city was established here back in the Middle Bronze Periods (e.g. 2,000 BC). This island also had many of the shops open for coffee and shopping. The sunset on the way back to Athenswas very nice. We also enjoyed some “Greek dancing” (especially Sue!) before we arrived back at port. Christos picked us up here. We drove back to the hotel for a late dinner. The beauty of these Greek islands was simply breathtaking! Today was our last day here in Athens. Once again we had fantastic weather, with sun and temps around 65-70. This morning was a morning of leisure. Some slept in and enjoyed a late breakfast while others got up and wondered out into the city on their own. Some went to the National Archaeological Museum while others walked to the Plaka once again for some shopping and another taste of good Greek culture. In the museum we saw the famous golden masks of Agamemnon from Mycenae (just south of Corinth) as well as many other artifacts (Poseidon) on display. It was quite impressive. At noon we all met back at the hotel. Boarding Christos’ bus and greeting Aliki our guide, we drove to the world-renowned Acropolis(it was closed on Monday due to a strike). 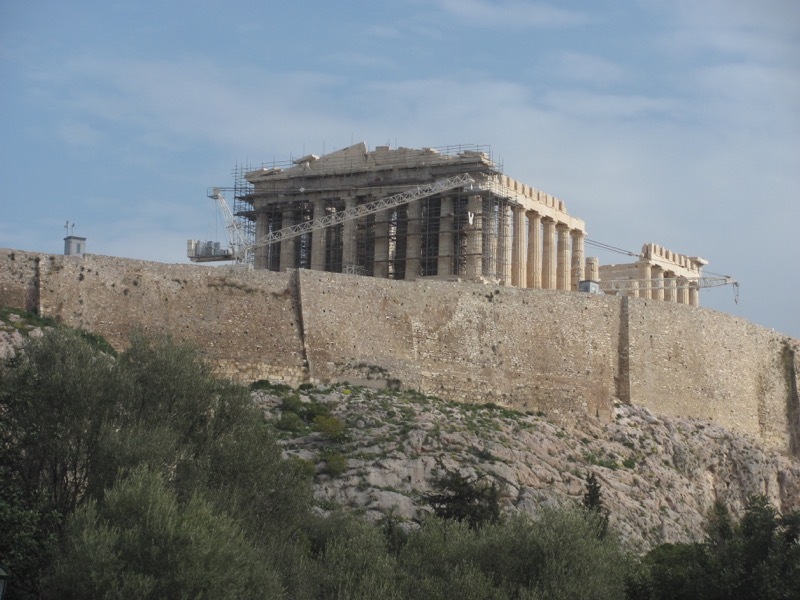 Climbing this ancient hill, we saw all the famous monuments still standing – the Propylea, the Erechtheumand of course the massive Parthenon/Temple of Athena. The building was officially called the Temple of Athena the Virgin(“Parthenon” comes from the Greek word parthenos, “virgin.”). 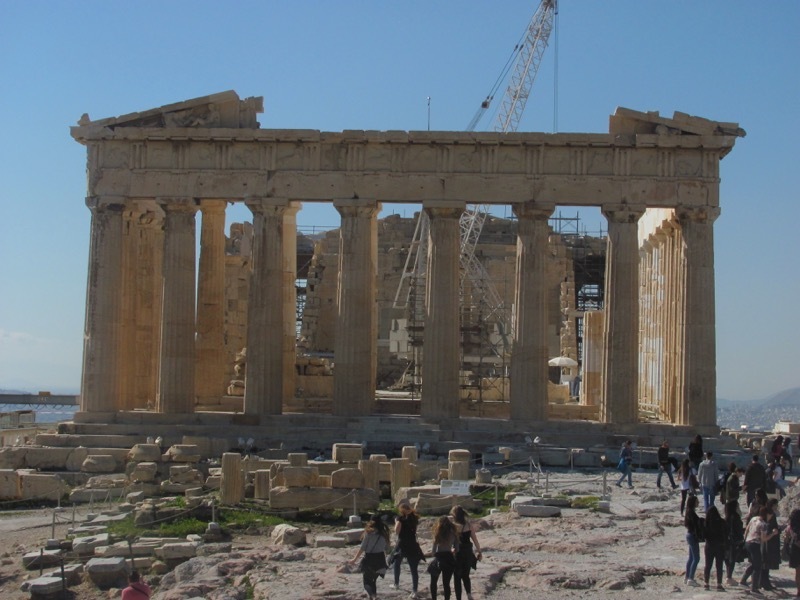 The building of the Parthenon began in 447 BC in order to replace an existing temple that was destroyed by the Persians in 480 BC. It was completed in 438 BC. 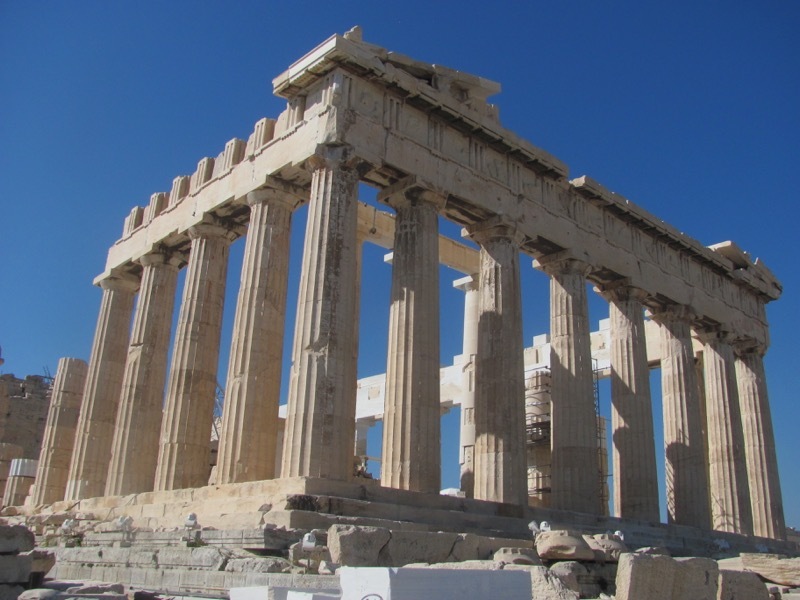 Measured at the top step, the dimensions of the base of the Parthenon are about 210 x 90 feet. It has a total of 46 outer Doric pillars and 19 inner pillars, for a total of 65. In the middle of the Temple stood a 40 foot statue of Athena. Like most other temples, it was built on a “4 x 9” ratio. From the acropolis we also could look down to the agora in one direction, and to the Temple of Zeus and Hadrian’s Arch in the other. To end the day, we drove about an hour to Cape Sounion.The drive was beautiful as the road winds around the coastline of the Aegean Sea. Once we arrived we saw the impressive Temple of Poseidon, the god of the Sea and protector of sailors. The temple is located right on the edge of the coastline. There are 15 standing pillars of 38 pillars that once stood here. The temple took four years to build (444-440 BC). The Apostle Paul would have sailed past this temple en route to Athens (from Berea, Acts 16). Nearby we also enjoyed a time one last time of quite reflection, worship, and reflection. We read from Psalm 91, perhaps a psalm that offered great comfort and encouragement for Paul on all his journeys. We drove back to the hotel for dinner. On the way, we stopped briefly by the beach for a marvelous sunset. At the hotel, we said goodbye to Aliki. She has been an excellent guide and we enjoyed her very much! Following dinner, most in the group retired early since we all have an early wake-up tomorrow for our flight either back home to the States or to Rome for the optional extension. It has been a wonderful trip with a wonderful group of people God brought together! This morning was an early wake-up call for everyone. With an early flight to Frankfurt and then back to the States, six in our group were taken to the Athens airport at 4 am. For seven others in the group, our flight to Rome for the optional extension was a few hours later. A few others arranged their own flights. For the seven of us continuing the trip to Italy, we arrived in Romeabout 10 a.m. Flying over Athens was clear, but the weather in Rome was overcast, yet with breaks of sun too with highs in the 50s. We were greeted by our agent, Georgio, and our van driver Marianno. We arrived at our first site of the day, St. Paul’s Church Outside the Walls (one of about 800 churches in Rome). Here we met our Rome guide for these next two days, Dortie. This church was first built in the 4thcentury AD, with early renovations taking place in the 5thcentury. Some wall mosaics within the church date to this time period. The church as it looks today was rebuilt in the 1800s after a fire. According to tradition (and there are a lot of them here in Rome! 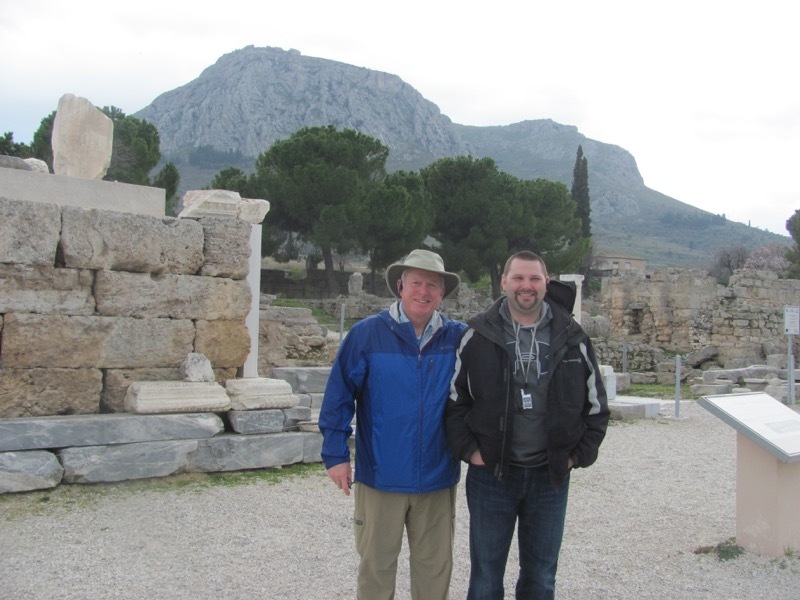 ), the Apostle Paul was buried here. The church building is actually magnificent, with many pillars and a decorative ceiling. Pictures of all of the 266 Catholic Popes are displayed around the perimeter of the sanctuary. At the front of the church are the “supposed” chains that bound Paul while he was in Rome. After lunch (pizza for most of us!) we visited the St. Sebastian Catacombs.It is located on the famous Apian Way on which Paul must have walked while in Rome. Sabastian was a 2ndcentury AD Christian martyr buried here. Between the 2ndand 5thcenturies AD, 1,000s of other Christians were buried here. The catacombs consist of 65,000 ancient graves spread out over a labyrinth of eight miles. A basilica was built above the graves by Constantine in 340 AD. We walked through part of the catacombs and the church itself. Next, we drove to the area of the Colosseum (where we got out first glance at it) and visited yet another church, St. Peter in Chains.This was a church first built in the 5thcentury AD, although the columns used in the sanctuary date back to early Roman times. This is where the famous Moses sculpture of Michelangelo is. The sculpture was part of the grave of Pope Julius II. 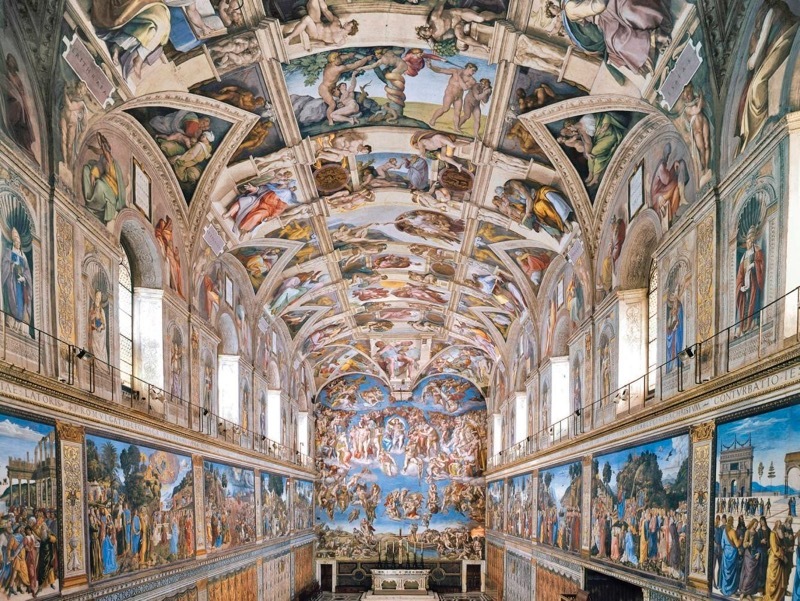 Interestingly, the famous sculptor was painting the Sistene Chapel at the same time. At the front of the church are the “supposed” double chains that bound Peter. Lastly, we drove to the other part of the city where we were dropped off close to the Trevi Fountain. There was a large crowd around this famous tourist attraction. The date of the building of the fountain is 1735-1765. Many of us enjoyed eating our first gelato in front of the fountain! Some even threw in a few coins. Meeting up with our van again, we drove to our hotel. After checking in, we enjoyed a very nice sit-down dinner in the hotel! After dinner, a few walked around the area of the hotel. Today was our first semi-rainy day. We had sun and clouds in the morning, but then rain came towards the end of the day. Highs were in the low 60s. We left the hotel at 8:20 today. We drove directly to the Vatican where we visited the museum and Sistine Chapel. About 850 people live in the “Vatican” today, the world’s smallest official “state.” Getting into the Vatican with special “VIP” status helped us avoid the hours-long lines. Upon entering, we got our first glimpse of St. Peter’s Church. When Michelangelo was 73, he started designing the dome of the church, the largest in the world. Walking through the museum filled with ancient artifacts, tapestries, and maps was breath-taking. Even the ceiling of the hallway is amazing! Finally we arrived at the Sistine Chapel. The uncle of Pope Julius II built it in 1483 when Michelangelo was only five years old. So many of his teachers began painting the images in the chapel. The ceiling was left blue, with golden stars until Michelangelo began his masterwork. It took him four years of painting the ceiling, and another five yeas to complete the Last Judgment scene on the front wall of the chapel. The chapel is simply stunning! Leaving the chapel we entered St. Peter’s Basilica. It is the largest in the world. The original church was built in 319 AD, but the present church was built in 1504. As we walked through the church, we saw the famous Pieta sculpture of Mary holding the crucified Jesus. We also saw the remains of a few popes who earned “sainthood” after their deaths. Leaving the church we entered Vatican Square.It is a large gathering place in front of the church itself. We enjoyed lunch in this area as well as some free time. Driving to the other side of the city, we visited the Colosseum next. This was a massive amphitheater built between 72-80 AD. It could hold up to 70,000 people back in the 1stcentury. It had four floors (although a fifth floor was added 10 years later. Gladiators fought here, although there were also fights with animals and even “ship battles” when the Colosseum would be flooded with water. Nearby we visited the Roman Forum. 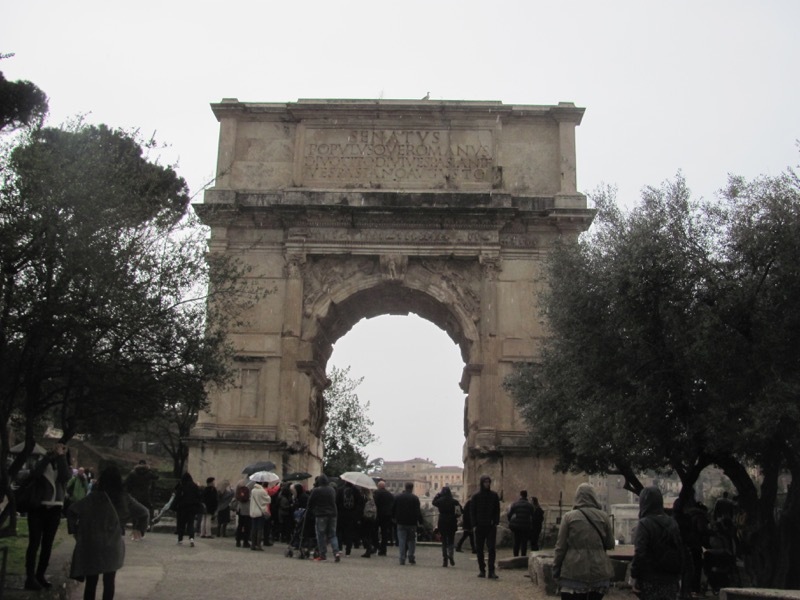 With the rain starting now, on the way we saw the Arch of Constantinople and the Arch of Titus. 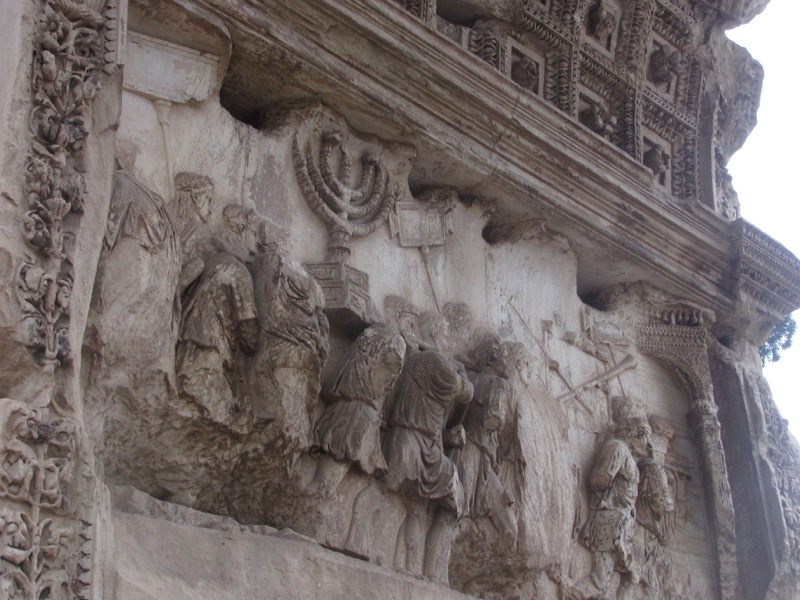 Sculpted in the inside of this arch is the Jewish Menorah, commemorating the fall of Jerusalem in 70 AD. In the Forum we saw various ancient structures associated with the early Romans (e.g. Julius Caesar). On the way to meeting our van, we walked past many other famous buildings from the past and the present. We drove back to the hotel for a few hours of free time. We then enjoyed dinner together, with a great view of the dome of St. Peter’s Church in the near distance. Today was our last day of the tour. After breakfast we walked to the train station for our “high-speed” journey to Florence, the home of Michelangelo. The ride was both smooth and fast (245 kilometer per hour). Sunny skies yet cool temps (highs about 50) greeted us when we arrived. Meeting our Florence guide (Letizia) at the station, we walked for the next 2/5 hours or so around this beautiful city. Our first stop was to the Academy of Fine Arts where the famous David sculpture is. Michelangelo sculpted this when he was only 26 years old. It weighs 17,000 pounds and stands 17 feet high. It is made of one piece of marble. It took him three years to sculpt (1502-1504). 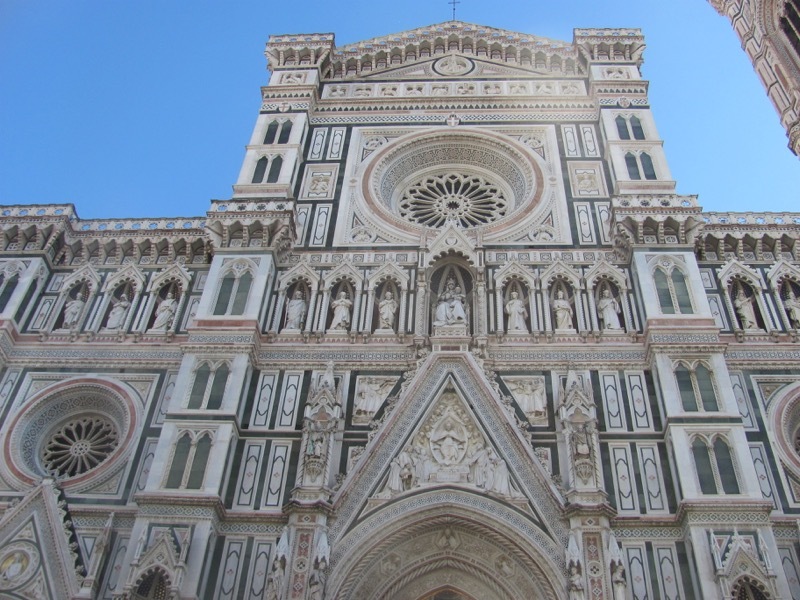 Nearby was the Maria del Fiore Cathedral. This is a massive church that took 140 years to complete (1296-1436 AD). The massive dome took 16 years alone. The façade of the cathedral was done in the 19thcentury however. Walking to the area of the Arno River, we also saw Santa Croce Church. Built in 1294 AD, the church serves as the burial place for some of the great artists. This includes Michelangelo, Rossini, Machiavelli, and Galileo Galilei, There is also a memorial to Dante, but his sarcophagus is empty (he is actually buried in Ravenna as he was exiled from Florence). For lunch, many of us enjoyed pizza on one of the main squares of Florence. We also enjoyed a free afternoon of shopping (Florence is known for its leathers). Walking back to the train station, we boarded our train at 5:15 back to Rome for dinner. We all retired early as we wake up early tomorrow (4:45 a.m.) for our flight home. DAY 14 – SUNDAY, FEBRUARY 26: ROME, U.S.A.